Hwang Ui-jo of Gamba Osaka was named this year's top footballer by the Korea Football Association on Tuesday. 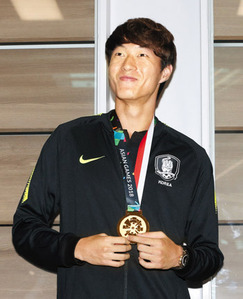 The striker earned the honor about a week after Son Heung-min of Tottenham Hotspur was voted Korea's top athlete of this year. At the KFA's annual awards ceremony at a hotel in Seoul, Hwang earned the highest score in a vote by KFA officials and reporters, beating Son and Jo Hyeon-woo of Daegu FC. Hwang became a new face to win the honor in the past several years. Ki Sung-yueng of Newcastle United claimed it in 2011, 2012 and 2016, and Son in 2013, 2014 and 2017, with Kim Young-kwon of Guangzhou Evergrande taking it in 2015. Hwang scored nine goals in seven games at the Asian Games in Indonesia last summer, including two hat tricks, helping Korea win a gold medal. Hwang is getting ready to play at the AFC Asian Cup in the United Arab Emirates which opens early next year. "I was able to build confidence for myself which would be one of my biggest gains for this year. I expect the upcoming Asian Cup to be another stage for me to make further growth."